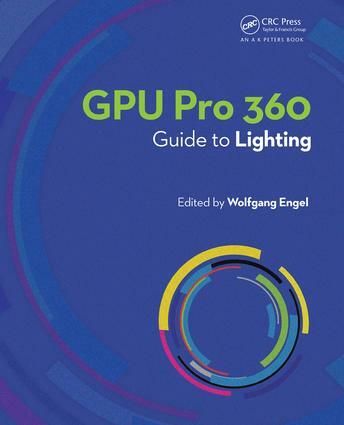 Wolfgang Engel’s GPU Pro 360 Guide to Lighting gathers all the cutting-edge information from his previous seven GPU Pro volumes into a convenient single source anthology on lighting. This volume is complete with 24 articles by leading programmers that describes rendering techniques of global illumination effects suited for direct rendering applications in real time. GPU Pro 360 Guide to Lighting is comprised of ready-to-use ideas and efficient procedures that can help solve many computer graphics programming challenges that may arise. Ch 1 Multi-fragment Effects on the GPU Using Bucket Sort; Ch 2 Parallelized Light Pre-Pass Rendering with the Cell Broadband Engine; Ch 3 Practical, Dynamic Visibility for Games; Ch 4 Shasder Amortization Using Pixel Quad Message Passing; Ch 5 A Rendering Pipeline for Real-Time Crowds; Ch 6 Z3 Culling; Ch 7 A Quaterninion-Based Rendering Pipeline; Ch 8 Designing a Data-Driven Renderer; Ch 9 An Aspect-Based Engine Architecture; Ch 10 Kinect Programming with Direct3D 11; Ch 11A Pipeline for Authored Structural Damage; Ch 12 Quaternions Revisited; Ch 13 gITF: Designing and Open-Standard Runtime Asset Format; Ch 14 Managing Transformaations in Hierarchy; Ch 15 Block-Wise Linear Binary Grids for Fast Ray- Casting Operations; Ch 16 Semantic-Based Shader Generation Using Shadedr Shaker; Ch 17 ANGLE: Bringing OpenGL ES to the Desktop; Ch 18 Interactive Cinematic Particles; Ch 19 Real-Time BC6H Compression on GPU; Ch 20 A 3D Visualization Tool Used for Test Automaation in the Forza Series; Ch 21 Semi-Static LoadBalancing for Low-Latency Ray Tracing on Heterogeneous Multiple GPUs.